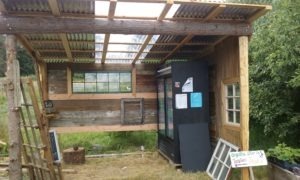 We have a new farm stand, not quite finished, it is open for business during daylight hours. 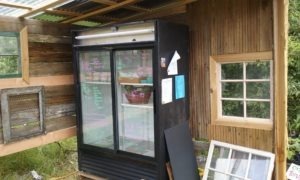 The farm stand does feature a reach in cooler and a self serve pay box. Exact change only please. Built as a community effort the post are made of split Cedar. Our neighbor Jacob Foss donated the 3, 12 foot Cedar logs. We did the splitting in the driveway. The decorative walls are made from well weathered boards. These weathered boards date back to 1890’s when our land was first homesteaded by the Frank and Clara Carlson. To this day the original 2 story homestead lies in ruins. So we have been slowly going through it looking for good boards we can use for decoration. Jack Poz. a dear family friend, Benny Nebraska and our interns Devin and Rebecca all help built the farm stand. You can find all sorts of farm fresh produce. Right now we have Royal Ann Cherries, Cane Berries (Marion, Logan and Boysen) Snow and Sweet peas, Kale, Swiss Chard & many herbs. That is just some of what you might find in the farm stand. Please, check it out and support The Shyre! Our farm and farm stand are located just north of Poulsbo, on Foss Rd. off Bond Rd. (SR307).